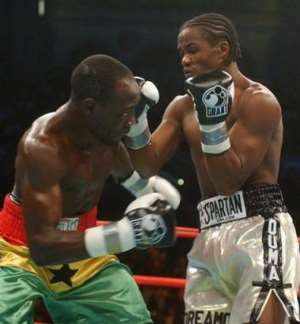 IBF junior middleweight champion Kassim Ouma picked up an easy victory Saturday night, coasting to a 12-round decision over Kofi Jantuah. Quicker and more aggressive, the 26-year-old left-hander started slowly, taking two solid lefts to the head from Jantuah in the first round, but looking no worse for the wear. Ouma (21-1-1) dominated after that, using his superior quickness and stamina to keep the taller Jantuah, who had a 3-inch height advantage, on his heels. By the fourth round, Jantuah (28-2) was heavy-legged and passive, and his head shook after Ouma connected. Showing no energy on defense, he could only hope for a lucky knockout as he swung wildly at the faster Ouma. Ouma, a native Ugandan who now lives in West. Palm Beach, Fla., opened a cut over Jantuah's right eye but couldn't manage a knockout. But it wasn't for lack of trying as he connected on 502 of 1,088 punches, according to punch statistics kept at ringside. "I was faster than him and I was slicker than him,'' Ouma said. "I was kind of surprised how easy it was. I thought it would be more difficult. Bring on who's next." Ouma out-landed Jantuah 502-to-254 in overall connections, according to unofficial CompuBox statistics, and 379-to-211 in power punches. Ouma improved to 21-1-1 (13 KOs, 1 NC), while Jantuah fell to 28-2 (18 KOs). Ouma made $150,000 for his first defense of the IBF belt he won on Oct. 2 in Las Vegas. Jantuah signed a $90,000 contract to meet Ouma. "My timing wasn't what I wanted," Jantuah said. "You can't get him with one shot and I couldn't put my punches together." The Jantuah-Ouma match marked the first recognized title bout between African-born fighters since June 24, 1957, when Nigeria's Hogan "Kid" Bassey beat Algeria's Cherif Hamia by 10th-round technical knockout to take the vacant world featherweight title in Paris. Ouma, a resident of West Palm Beach, Fla., was born in Uganda, but sought political asylum in the United States in 1998. Jantuah was born in Ghana, but now fights out of Las Vegas.